Over the Summer, Stonewall platformed LGBT groups and Pride organisers to share what Pride means to them. We’ll be continuing this series, speaking with more of the diverse communities bringing Pride to life across the year. Here is Spencer Blackwell of Trans Pride South West. Previously in this series: KeshetUK; Finding a Voice. Not all views are necessarily Stonewall’s. To learn more about the project email pride@stonewall.org.uk. For someone who doesn't know very much about Trans Pride South West, how would you explain what you do? Trans Pride South West is a national annual Pride festival that aims to build community and create a space for transgender, non-binary, and gender variant individuals to share resources and knowledge. Trans Pride South West runs every November in Bristol following Transgender Awareness Week. Our programme features a variety of events across many days, including a Community Day, a Vigil for Transgender Day of Remembrance, and various workshops and performances. For us, Pride is a chance to build community and solidarity. For us, Pride is a chance to build community and solidarity. Even as a team, those involved with Trans Pride South West have a range of identities and backgrounds, but love coming together and sharing our experiences. Pride is an opportunity for us as part of the LGBT community, to connect with each other and support each other (and have some fun too!). Has your organisation been involved in your local Pride? If not, why not? We have been involved with Bristol Pride and other LGBT events in Bristol, and we love getting our name out there and being actively involved in the rich LGBT culture of Bristol and the South West. As a group of volunteers, we’ve learned a lot about how hard it can be to run large-scale events! We rely on donations and fundraisers to run our programme of events each year, as well as the valuable time committed by our volunteers. We’ve also learned that every Pride festival is different. We are an unusual Pride as we run in November rather than the hot summer months, and so our Pride looks different to many others. Lastly, we’ve seen the fantastic strength of Trans Pride South West, as we are free to run our events in a way that suits our community; through creating spaces to share valuable information and resources, as well as partying! Prides are increasingly looking to improve their inclusion, but more still can be done. What changes have you seen in the way Prides are run since you've been involved? Prides are increasingly looking to improve their inclusion, but more still can be done. Especially as a minority within the LGBT community, events for the trans and non-binary communities need to make sure that everyone is invited to the table – this means accessible events and inclusion of QTIPOC, and most of all, listening to others. Even within LGBT spaces, trans and non-binary people can be excluded and discriminated against. What does it feel like not to be included or accommodated? It’s a really awful feeling to attend LGBT events and feel excluded as a trans person; whether that’s through bathroom policies at venues, transphobic or transmisogynistic comments from other attendants, or hearing a performer on stage use transphobia as a vehicle for a joke. Even within LGBT spaces, trans and non-binary people can be excluded and discriminated against. Trans Pride South West aims to provide a space for trans and non-binary people to not only just be included, but to be the focal point of everything we do. What positive examples of inclusion do you have from your experience? 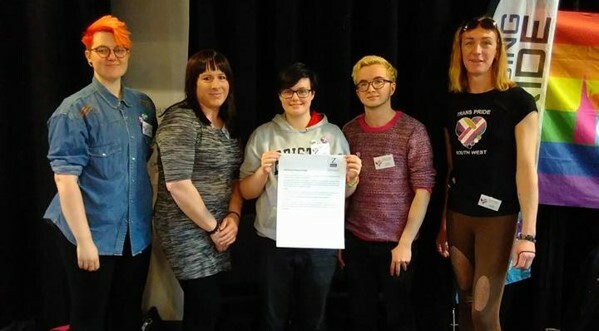 As well as running our own events, Trans Pride South West works with other local events and organisations on inclusion of trans and non-binary people. It feels great to have organisations reach out to us and ask how they can better include trans and non-binary people, as we are just as deserving of a seat at the table as everyone else! If someone was looking for innovation or guidance, what would you recommend? We love to support and promote resources that cater to the trans and non-binary communities in the South West. Some resources are Transcaf, a Bristol-based trans and non-binary social and support space, and other groups such as Transfigurations based in Devon, who have useful resources such as an online database of trans-friendly GPs in the South West area. The history of LGBT liberation begins with trans, non-binary, and gender non-conforming people standing side-by-side in protest with our LGB siblings. What’s your closing single message for Pride organisers? Actively include trans and non-binary people in Pride events! The history of LGBT liberation begins with trans, non-binary, and gender non-conforming people standing side-by-side in protest with our LGB siblings. This especially includes marginalised groups such as trans and non-binary people of colour and those with disabilities. We deserve to also be supported and celebrated within Pride – whether that’s through hosting talented and entertaining trans and non-binary performers, by inviting trans and non-binary speakers to events, or just by supporting and advocating for trans and non-binary rights. Trans Pride South West will be running from 21 - 25 November 2018. All are welcome and you can keep up to date on the Facebook page or website.